Lately I have had quite a few questions about picking out the right white paint. So today we’re going to talk about a few of the most versatile, fail-proof, go with everything white paint colors there are. When it comes down to picking out the perfect white paint and you have dozens of choices to choose from, it can be a little overwhelming. Warm whites, cool whites, ultra whites, creamy whites – it’s kind of hard to know what to pick. 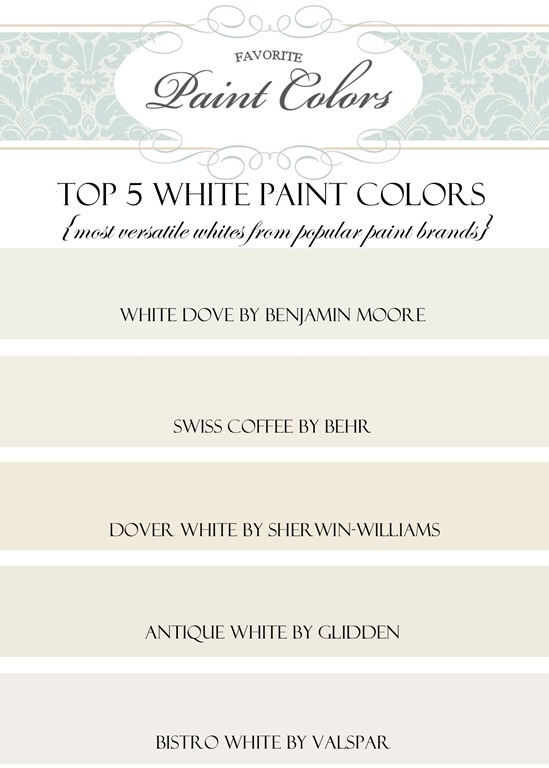 So I have taken my number one choice from 5 popular paint brands (Benjamin Moore, Behr, Glidden, Sherwin-Williams and Valspar) to hopefully help you narrow down your choice. I love these whites because they will work for anything and go with pretty much any color. Whether you are painting trim, wainscoting, walls, cabinets or a piece of furniture, these colors will work beautifully. Here are some of my favorite inspiration pictures using the colors above. The wall color is White Dove by Benjamin Moore. I love how clean and classy white walls can make a room feel. White Dove on the kitchen cabinets and island. Another fresh, clean look. The board and batten and trim are all painted Swiss Coffee by Behr from this lovely guest bedroom. All of the trim is painted Dover White by Sherwin-Williams. 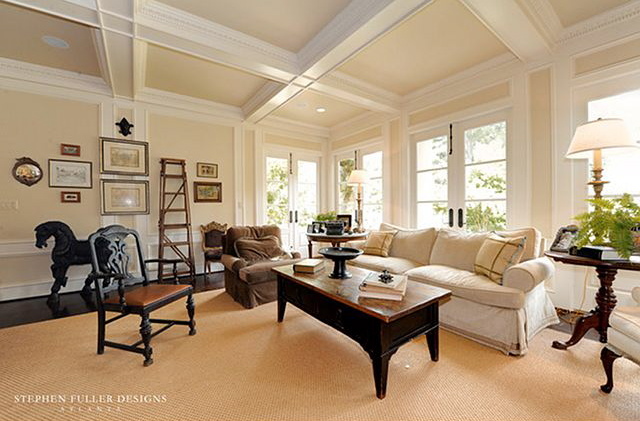 Love the contrast it gives to this other light neutral. 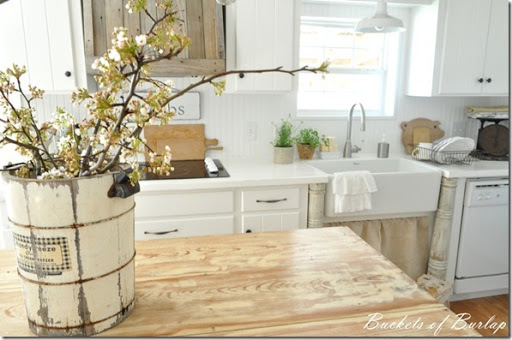 Katy from Made by Katy used Antique White by Glidden when she painted stripes in her laundry room. So cute! 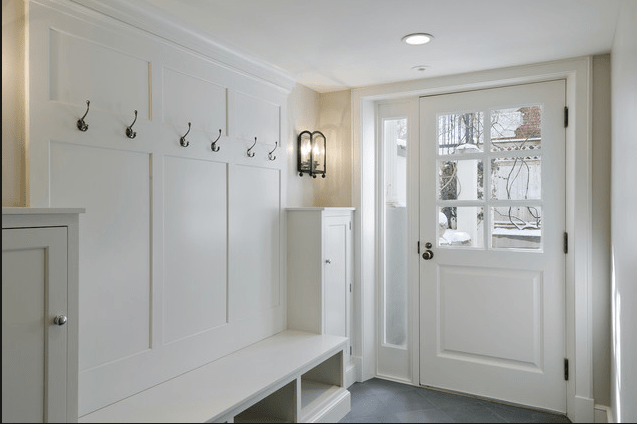 LOVE this mudroom painted Bistro White by Valspar. And painted countertops in Bistro White. So pretty! For more pictures and inspiration of white paint on FPC, see here. So what about you? Is there favorite white you have used in your home? I would love to hear about it. Have a beautiful weekend! !